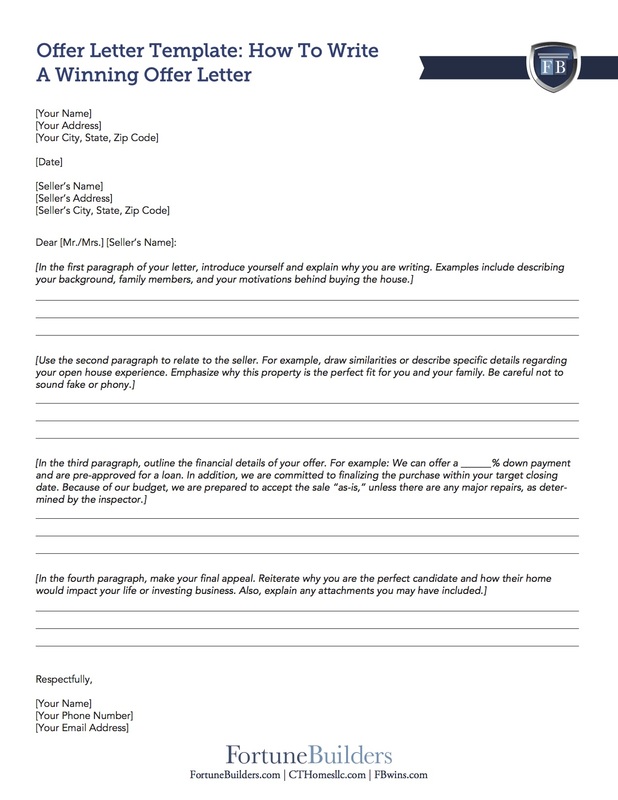 Have you ever wondered how to write a real estate offer letter? How should you address the recipient? What should the tone of the letter resemble? Perhaps even more importantly, what should you talk about when the numbers aren’t enough? If you have ever wondered how to write an offer letter, and are—more or less—asking yourself these questions, look no further. Below you will find what should be included in your next offer letter and what will give you an advantage over the competition. Not surprisingly, offer letters are drafted to address one specific issue: the amount you are willing to pay for a respective property. The intentions should be clear and the letter should answer more questions than it asks. It’s worth noting, however, that offer letters aren’t simply a means of submitting an offer; they are also your chance to make a great first impression. After all, what seller wants to work with someone they don’t trust? Exercise common curtesy and refer to the seller by their full name. Express why you love the property in an endearing way. Divulge personal information about yourself. Include a photo of yourself for a reference. Highlight any commonalities you and the seller may have. Remember to keep the letter to seller leads short and simple. Finish strong and be sure to reaffirm your genuine interest in the property. Real estate is a people business, and it’s important that we never lose touch with the human element—even when communicating through a correspondence letter. Having said that, the most important step in writing an offer letter is perhaps the simplest: address the seller by their name. Exercise common curtesy and refer to the seller by their full name at the top of the offer letter, and you will find that it can make a world of difference. Don’t believe me? Consider the alternative. Not only does starting off your offer letter with “Dear Seller” suggest a lack of curtesy, but it also acknowledges the fact that you neglected to do any additional research upfront. Remember, sometimes what you don’t say is just as important was what you do say, and those that don’t address the seller by their name are speaking volumes to their lack of professionalism and commitment. It’s worth noting that the seller is likely receiving multiple offer letters, and anything you can do to separate your letter from the competition is advised. I can assure you that using the seller’s name will sound a lot better than a generic placeholder. If for some reason you don’t have their name, feel free to ask the listing agent. Despite their latest attempt to sell the home, it’s safe to assume the owner has developed a nostalgic attachment to the property. While you may not know the intricacies of their particular affinity, it’s entirely possible to use their own personal attachment to your advantage. Over the course of your offer letter, don’t hesitate to play off of their own attachment to the home. Divulge what it is you like so much about the property, and you my find your appreciation reciprocated. In highlighting what you like most about a home, you are accomplishing two important things: you are reaffirming your intentions to follow through with a purchase while simultaneously establishing an emotional connection with the seller. Remember, a little flattery can go a long way. Why wouldn’t you want to do everything you can to secure a deal, especially if all you have to do is compliment the home you are already genuinely interested in? Calling attention to the home’s best features may place the seller at ease, as they are more likely to sell to someone they feel won’t tarnish their own memories of the property. If you want to learn how to write an offer letter, try exercising a little humility and putting the seller’s needs ahead of your own, even if they are superficial. In addition to addressing a few personal items about the seller, I recommend sharing a little bit about yourself. Don’t assume sellers only want to hear about themselves; they want to ensure the property is going to be in good hands, so convince them that you are their best option. Include personal facts from your own life. Do you have any children? What would this house mean to a family looking for a home? There are a number of directions you could go with this, but the idea remains the same: fabricate a picture of what acquiring the home might mean to you. The more friendly of a picture you can paint, the more likely the seller is going to favor your offer over the others. If you can convince them that their home will be in good hands, you are already ahead of the curve. Remember, the whole idea behind an offer letter is to place yourself ahead of the competition and land a deal. In providing sellers with the right information about yourself, it’s entirely possible to generate positive sentiment. And it’s worth noting that said sentiment may be the only thing that separates you from the competition. In an industry as competitive as real estate investing, that may be enough to land you the deal. In addition to revealing a few things about yourself, it can’t hurt to include a picture. You would be surprised at how many people want to be able to put a face to the words they receive. It’s also worth noting that this step should be viewed as a compliment to the previous one. The idea is to help sellers envision who will be living in their home long after they are gone. And while you may not be the one living in the house after you buy it, your are the next in line to decide who will call it home next. Believe it or not, sellers want to know their home will be in good hands, and if a picture can sway them into thinking your hands are the safest, why wouldn’t you include one? Generally speaking, a great offer letter forms a relationship between two otherwise complete strangers while simultaneously sparking negotiations. While the offer letter should certainly talk numbers, you don’t want to be too forward. Instead of throwing a number out and seeing if it sticks or not, continue to develop the relationship I have discussed in the previous four steps. One thing I like to do is to highlight any commonalities that may exist between myself and the other party. Few conversations are more beneficial to the foundation of a relationship than one that revolves around the similarities each party has. And while you may not know the seller personally, you can typically glean everything you need to know from what their home says. Find something you both have in common and use it to your advantage. You will find that few things can break down barriers faster than a common interest in something. It’s safe to assume that you aren’t the only interested party in a particular property. Neglecting to assume anyone else is interested in acquiring the same deal is simply ignorant, and a sure-fire way to lose a deal. Instead of writing an offer letter without any sense of urgency, do the opposite. Understand the situation you are in, and even the seller’s. You must assume they are receiving multiple offer letters. As a result, make your offer letter as short and concise as possible while still leaving room for everything I have discussed up to this point. In the midst of a bidding war, the brief tone of a well-drafted offer letter may place it ahead of the completion. If for nothing else, sellers may not have the time to sit down and read those letters that are far too lengthy. Don’t let your letter get passed over because you wrote too much. In wrapping things up, don’t forget to reaffirm your genuine interest in the property. Sellers are more comfortable when they are positive buyers aren’t wasting their time, and this is your chance to let them know you can be counted on. It’s also a great idea to thank them for their time in advance. Let them know their time is valuable and you appreciate the consideration. There is more than one way to write a real estate offer letter. The house offer letter sample above simply happens to be one of the many templates that have demonstrated an increased propensity for success. However, that’s not to say there aren’t several other ways to capture the attention of a potential seller. Today’s best offer writers know it, and it’s about time you did, too: the more you know about writing a real estate offer letter, the better off you’ll be at crafting one. Therefore, it’s in your best interest to know the answers to some of today’s most frequently asked questions about writing offer letters. Do Real Estate Offer Letters Have To Be In Writing? Real estate offers should be made in writing, regardless of your personal relationship with the seller. At the very least, presenting an offer in writing simultaneously expresses your intent and provides a touch of professional curtesy. Perhaps even more importantly, however, a well-crafted offer letter is unquestionably more widely accepted than the alternative: a verbal offer. That’s not to say it’s impossible to submit an offer verbally, but putting the offer in writing will almost always serve a potential buyer better. Can You Make An Offer On A House That Is Under Contract? It is absolutely acceptable to make an offer on a house that is under contract. If for nothing else, there’s always the chance the contract could fall through. Whether the buyer can’t receive the appropriate funding or an inspection contingency permitted their withdrawal from the impending purchase, there are countless reasons a contract may never be realized. That said, it’s never a bad idea to submit an offer on a home that’s already under contract because there is always a chance it won’t close. Writing a real estate offer letter on a home that is under contract simply awards the seller another offer to entertain. It is worth noting, however, that while you may write an offer at any time, sellers can’t just walk away from their contracted buyer, regardless of how good your offer is. Sellers are contractually obligated to stick with an offer as long as it’s under contract. As a result, any offer you write while a home is under contract is simply an alternative offer to consider in the event the initial one isn’t realized. Does A Real Estate Agent Have To Present An Offer? Real estate agents do not need to present an offer on your behalf. It is possible for an unlicensed investor or homebuyer to submit an offer of their own. However, it’s worth pointing out that real estate agents are typically better at making offers than, well, just about everyone else. Their expertise in a given neighborhood ensures they are working with the right information. As a result, their offers tend to be more calculated and accurate. While real estate agents may come with a price, their negotiation skills and knowledge on a given market are often well worth the cost of admission. So while it may not be necessary to work with a real estate agent, you may want to consider enlisting their services. Can A Seller Back Out Of An Accepted Offer On A House? Sellers are not allowed to walk away from a contracted buyer; they are (not surprisingly) contractually obligated to follow through with the sale unless any predetermined contingencies are met that would allow either the buyer or seller to walk away. In fact, there are a number of reasons a sale may fall through, but the seller is never allowed to walk away from a contracted buyer simply because they want to or another offer comes along. Learning how to write a real estate offer letter isn’t exactly rocket science, but there are a few critical issues you need to address, namely the rapport you intend to build. 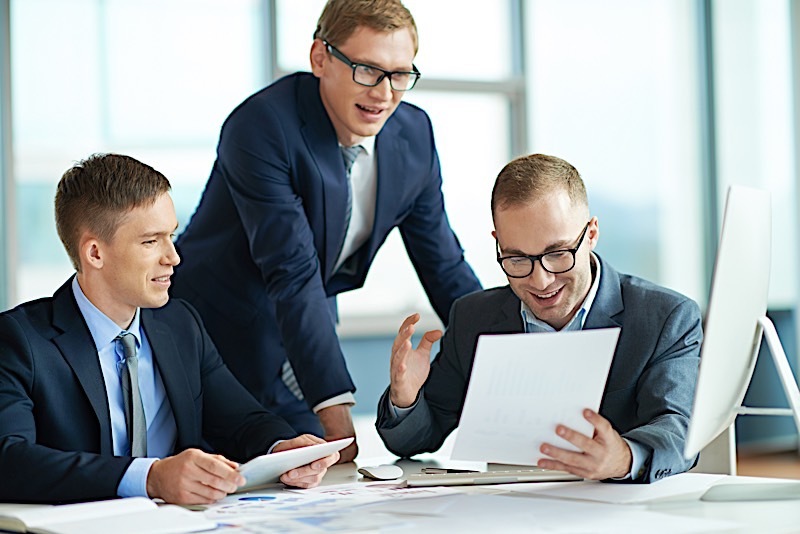 And while no offer letter is complete without a few strategically picked price points, it’s in your best interest to develop an inherent level of trust before you start negotiations. After all, sellers are going to want to work with those they trust. What better way to do that than in a well-drafted offer letter? Writing a tactful and respectful real estate offer letter will increase your chances of acquiring a deal. Sending an offer letter to seller leads may get the ball rolling, but it’s just the beginning of negotiations. Learning how to write an offer letter for a house is a skill no investor should be without.